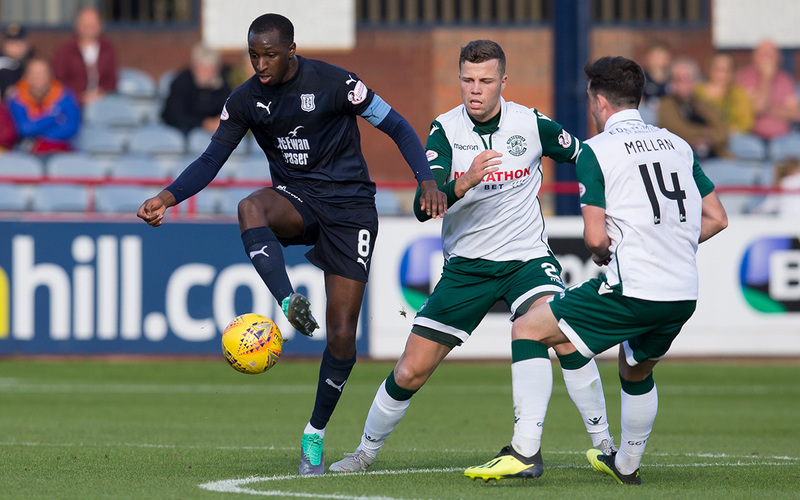 Dundee lost 3-0 at home to Hibs this afternoon as Florian Kamberi, Martin Boyle and Thomas Agyepong scored the goals that leaves the Dark Blues without a point after six matches. Dundee started well and were in contention throughout the first half. When Hibs stepped up a gear after the break, however, Dundee had no answer. There were three changes to the Dee’s line up. Ryan Innis came in for his first start. Glen Kamara returned from injury, and Adil Nabi started after coming on as a substitute last week. Darren O’Dea and Jesse Curran switched to the bench and Kenny Miller was suspended. Hibs made three changes; Paul Hanlon, Mark Milligan and Vykintas Slivka came in for Ryan Porteous, Steven Whittaker and Emerson Hyndman. The Dark Blues started brightly, moving the ball around neatly in the Hibs half. After two minutes it took a fine save by Adam Horgan to stop Dundee taking an early lead. After a patient move Adil Nabi found space just outside the penalty area, but the Hibs keeper at full stretch turned his curling shot round the post. Dundee were playing confidently and looked the better side for much of the first half. The visitors took a long time to get their game going, but gradually worked their way back into the match and finished the half on top. Ominously they fashioned the best two chances of the half in the 15 minutes before the break. Daryl Horgan headed wastefully back across goal and wide when he found himself free on the end of a cross from Martin Boyle. Another dangerous Hibs attack ended with David Gray working his way into space on the right and his cutback arrived perfectly for Florian Kamberi who was denied by Elliott Parish’s great instinctive save with his feet. After the opening 20 minutes Dundee were finding it harder to penetrate Hibs’ penalty area. The only time they opened up the defence Kharl Madianga went down in the penalty area under a challenge. Mr Dallas produced a yellow card for simulation, a decision that might have gone either way. Madiange didn’t reappear after half time and Jesse Curran came on to replace him. The trend of the first half had been one of gradual improvement for Hibs and increasing difficulty for the Dee. Sadly that foretold how the second half would pan out. Hibs launched themselves at Dundee straight from the restart and didn’t ease up until they had killed off the Dark Blues with two goa;ls in the first 10 minutes. Hibs almost opened the scoring within a minute when Kamberi curled a shot against the post from wide on the left of the penalty area. Steven Whittaker, who had come on as a half time substitute, followed up but Parish turned the ball out for a corner. Dundee’s luck held out for only a few more minutes and they were opened up by a simple pass by Boyle through the central defence for KAMBERI to touch the ball past Parish and over the line. Three minutes later it was 2-0 when Efe Ambrose swung the ball out to BOYLE on the right and the ex-Dee had space to run at the defence before scoring with a beautifully struck low cross shot. The two quick goals deflated the Dee and Hibs were never in any danger from then till the final whistle. Following that deadly spell of attacking Hibs settled on their decisive lead for a while, but they were always in total control of the match. The Dark Blues were deflated and couldn’t reproduce any of the neat football they had played in the first half hour. On the few occasions they managed to get the ball into Hibs’ penalty area the defence had little trouble fending off the Dee. In the final third the passing, the crossing and the movement were nowhere near good enough to trouble Hibs. 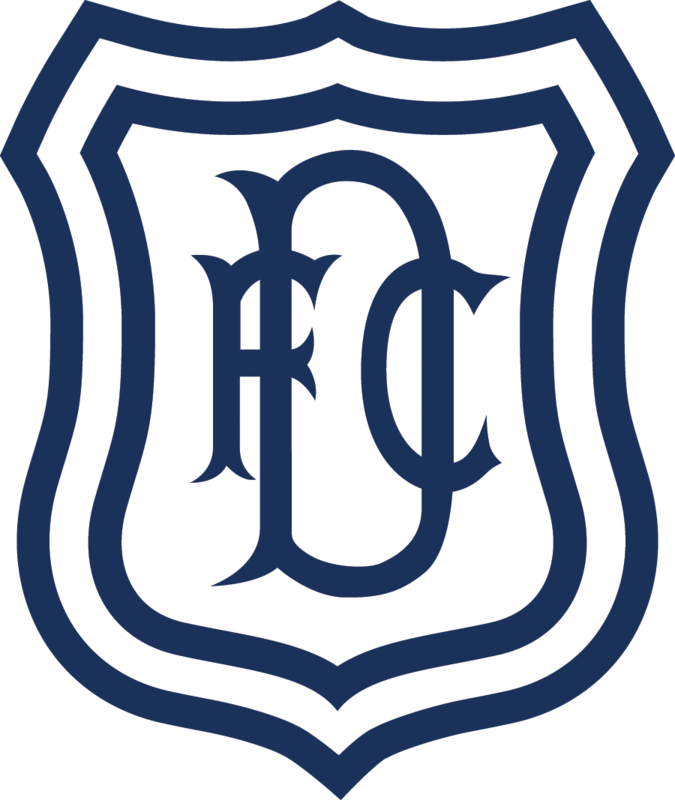 While Dundee’s attempted attacking was ponderous Hibs were calmly efficient as they moved the ball forward, finding space easily and exposing the Dark Blues’ defensive frailty. If Hibs had maintained the ferocious tempo that blew Dundee away at the start of the second half the scoreline might have been dreadful long before the end. As it was, only one team looked like scoring again. Kamberi went close with a header, and there was a succession of shots that sailed high or wide, or posed little trouble to Parish. It seemed possible that Dundee might reach the final whistle without further punishment but Hibs substitute Thomas Agyepong ended that faint hope with a late third goal. Granted too much space to run in from the right AGYEPONG, in a repeat of Boyle’s goal, ran on to lash a low shot across Parish and inside the far post. The Dark Blues did offer the fans some hope with their brisk start to the game. There was lots of attractive passing and movement against a sluggish Hibs team. However, there was only one serious effort on goal, when Nabi almost gave the Dee an early lead. After that the Dark Blues showed how fragile they are against opponents who are organised and determined with a dangerous cutting edge. Once the game swung against the Dee there was little response; they were impotent in attack and vulnerable in defence. The uncomfortable truth is that both teams came out of the match with what they deserved. Unused subs: Hamilton (gk), O’Dea, Spence, Dow. Booked: Miller (foul on Gray), Madianga (simulation). Unused subs: Laidlaw (gk), Bartley, Hyndman, Porteous. Goals: Kamberi (51), Boyle (54), Agyepong (88). Booked: Stevenson (foul on Curran). Referee: Andrew Dallas. Assistants: Calum Spence, Anthony Cooper. Fourth Official: Colin Steven.